You would have thought I was studying for a cooking final. I had cookbooks spread out on the kitchen table. My recipe file was open. Pinterest was up on the computer screen. And the recipes I've torn out of magazines over the years "to try" had been well perused. All I was doing was trying to come up with 10 days worth of meals, side dishes and all, so I could prepare for the visit of my son and his family. The idea was to have a healthy variety and lots of color at every meal. Two hours later I was finally done. Whew! If you are like me and frozen peas and corn steamed in the microwave just won't cut it, you might be searching for healthy side dishes, too. To help you, I have put together a collection of 18 veggie sides with links to recipes so you don't have to pull out every cookbook you own to find something to serve with your meatballs! The nice thing about salads is if you don't have the exact ingredients, you can probably substitute for a similar, or totally new, taste! Carrot Salad - always a winner with young and old. I used to serve this in Colombia and people who never ate vegetables would go for seconds! Broccoli Salad - what's not to love, there's bacon involved! Coleslaw - I just shred the cabbage (or buy it shredded when it's on sale) and toss in some bite-sized apple pieces, raisins, peanuts and use a small container of vanilla or lemon yogurt mixed with 1 tablespoon of oil and 2 of vinegar and stir it all together. So easy. Harvest Salad - kind of a variation on the Waldorf. Tomatoes and Cucumbers - slice thinly and arrange on a plate alternating red and green. Drizzle with lemon juice, italian dressing, or a bit of olive oil and salt and pepper. Start with some artisan or romano lettuce, the dark leaves have more iron and are so much prettier! I have made many lunches of a large serving of roasted vegetables. I love, love, love them! Carrots - another winner; they seem to shrink in the oven and everyone loves them, so make a lot! Sweet Potatoes - can you believe I have family members who don't like sweet potatoes? I love them! Tomato Halves - I cut them in half, sprinkle with bread crumbs, shake a bit of garlic salt and pepper on (and maybe oregano or basil), a tiny bit of shredded cheese, and bake them till tender and the cheese is melted. The time depends on your oven temperature where you are cooking other things, probably 7-20 minutes. Ever since I started making Walnut Chicken in the 80's, I've been a fan of stir fried vegetables. If you aren't used to them, perhaps the last minute character of them isn't good for having company, but they are quick and delicious. All these recipes are basically: heat 1-2 tablespoons of oil in a non-stick skillet or wok; add vegetables cut into wedges, chunks, or strips; season with salt and pepper and any other herb that sounds good; stir frequently until they begin to brown. Serve immediately. Mushrooms and Onions - I pretty much add onions to anything, but I like this one with the onions coarsely chopped instead of big. Green beans and Almonds - I use frozen most of the time and this works great. Add the almonds when you are almost done to just heat them a bit. I love nuts in my food. 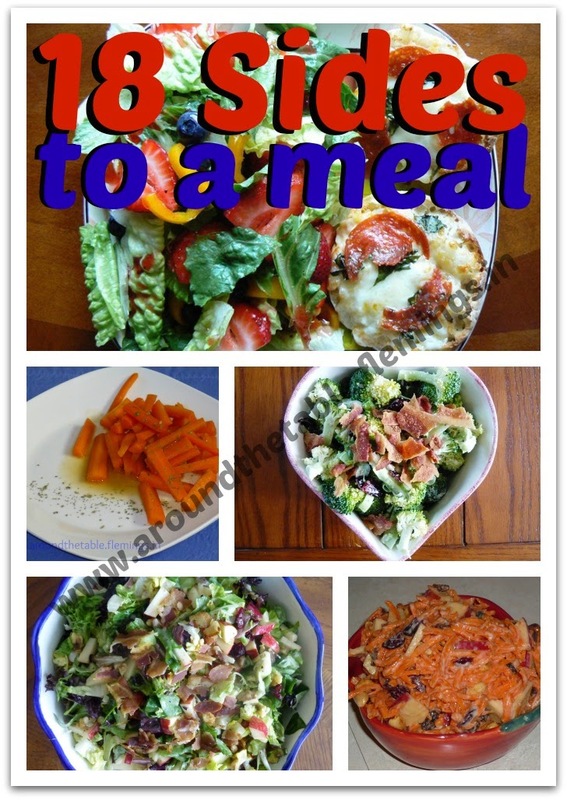 I hope these side dish ideas have given you some help when you are planning menus. Maybe they just trigger your memory of other sides you have used in the past. Tell me about them. I'm always looking for more! Did you know that Around the Table: Connecting With Your Family at Mealtimes is available on Kindle? You can get a copy today for only $4.75! Get a Conversation Starter question each week night by *liking* the Around the Table Facebook page! How about "pinning" this post to your Pinterest page? I like to have lots of options. I'd love to hear of others' healthy sides. Wow! well done! plenty of healthy food. Sometimes I have more fun creating the sides than the entrees. Thanks for sharing all these great side ideas at Thrive at Home.